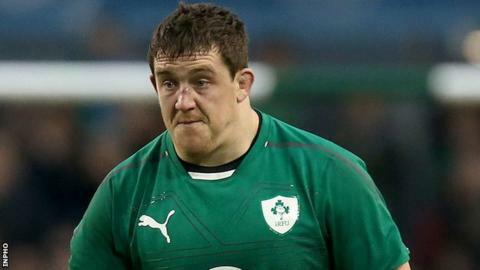 Ulster and Ireland prop Declan Fitzpatrick has retired at the age of 31 on medical advice. The decision is a consequence of the concussions he has suffered in recent seasons. Fitzpatrick played 98 times for Ulster and won seven caps with Ireland, three of which were against New Zealand. Ulster said Fitzpatrick had been referred to a leading neurologist who recommended it would be in his best long-term interests to stop playing. In April last year, the Ulster tight-head had treatment for an irregular heartbeat after suffering palpitations during a match against Glasgow. "While it was not an easy decision to hang up the boots, I can look back with fondness at nine fantastic seasons at Ulster," said Fitzpatrick. "It was a huge honour to have represented my country and an enormous privilege to pull on that green shirt. I have played alongside some brilliant individuals and have made lasting friendships. "I want to thank the medical teams at Ulster and the IRFU for the care they have given me. My symptoms continue to improve and I know the advice I received was in the best interests of my long-term health." Fitzpatrick joined Ulster in the summer of 2006 and made his debut for the province in a 31-16 win over Scarlets in September that year. He scored his first try in his second game for the province, against Newport Gwent Dragons. His third and final try, also against Dragons, was in November 2014. Fitzpatrick made his Irish debut against New Zealand in Auckland during the 2012 summer tour and won his final cap as a substitute in Ireland's defeat by the All Blacks in 2013.